A potentially dangerous pothole on Boulevard Place near Apartment Village. Potholes are scattered across Butler’s campus. Collegian file photo. This is not an unpopular opinion. 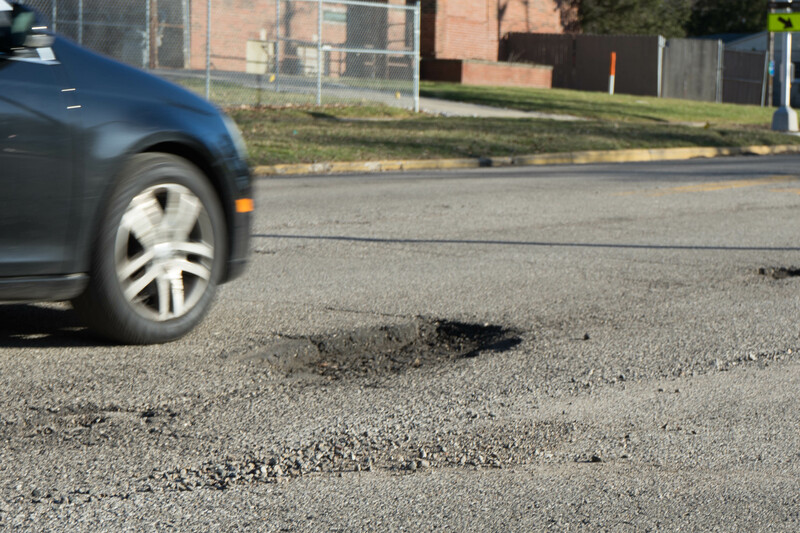 Talk to anybody — student, faculty, random passerby — and the perspectives you hear will always be the same story: potholes create an inconvenience. On the one hand, they slow the world down. It is quite inhibiting to be driving down Michigan Road, slowing down every five feet so you do not get completely sideswiped by the conglomeration of holes twice the size of manhole covers that appear in the center of each lane. Then there are the instances where worse comes to worse, and your worst nightmare comes true when you hear the foreboding clank as your tire is flattened, accompanied by swerving as you try to regain control of a sinking ship. There are few worse feelings one can experience than the realization that they are about to unwillingly spend — though it feels “waste” would be a more accurate verb — $200 on a new tire. I believe I can say that with confidence because it happened to me. On Feb. 23, I was driving back from dinner, traveling on Boulevard Place, when I hit the pothole. It was in the middle of the lane; on my left was an oncoming car barreling ahead in its lane, and on my right were a line of cars parked in the street. Left stranded without any good options, I took my chances and swerved a little bit to the right, as far as I could. In doing so, my front left tire hit the corner of the pothole and I heard the dreaded sound as the hole ripped across my tire. At first, I was angry at the state of Indiana. The state government’s lack of good governance is a frequent topic of discussion, both amongst Hoosiers and those attending school here. But as I did more research, I became increasingly aggravated with Marion County. According to Indiana state law, while it is the responsibility of the state — specifically the Department of Transportation — to fix state roads and highways, it is the responsibility of individual counties to fix county roads. This brings us to the big question: how can we fix this problem? While different people undoubtedly have different ideas, I think it is safe to say that Butler can play a part. I know that it is easy to criticize the university which one attends. I even think that a lot of the time, the criticism and anger directed at these institutions is not exactly fair and often seems disingenuous. I recognize that my recognizing of that can make the following — and I suppose the preceding — comments seem hypocritical. But here is the thing: Butler has the power to positively change the community. The potholes are an inconvenience for everyone, and it is the responsibility of Marion County to address that. But it is clear that will not happen without pressure, and who better than Butler to apply that? It is the most prominent institution in the county, and almost certainly brings in the most money. All Butler needs to do is write a letter to the county officials asking for the roads to be fixed. A budget was recently passed that gave the Department of Public Works — the department that is in charge of fixing infrastructure in Indianapolis and Marion County — an additional $120 million for fixing streets, sidewalks and stormwater drainage, so it is not an issue of lack of money. If the county’s most influential institution wants something changed, it is hard for me to believe they would not listen. But here is the other thing: the responsibility is not only on Butler. Perhaps I am too idealistic, but I still believe in the power of the collective voice of the people. If the county receives enough letters and calls from its constituents, I truly believe they will act. Just because you are a student does not mean you do not get a say. Write an angry letter, make a polite phone call asking that the issue is resolved. If we want change, we can force it. The potholes are undeniably a pain, and the blame can not fall on us that the issue is as prevalent as it is. That does not mean that we can not take responsibility for the solution.